YES™ Ultimate Mineralsare an effective way to replenish some of the essential minerals that nature intended for us to receive on a daily basis, before commercial farmers and food processors ruined them. 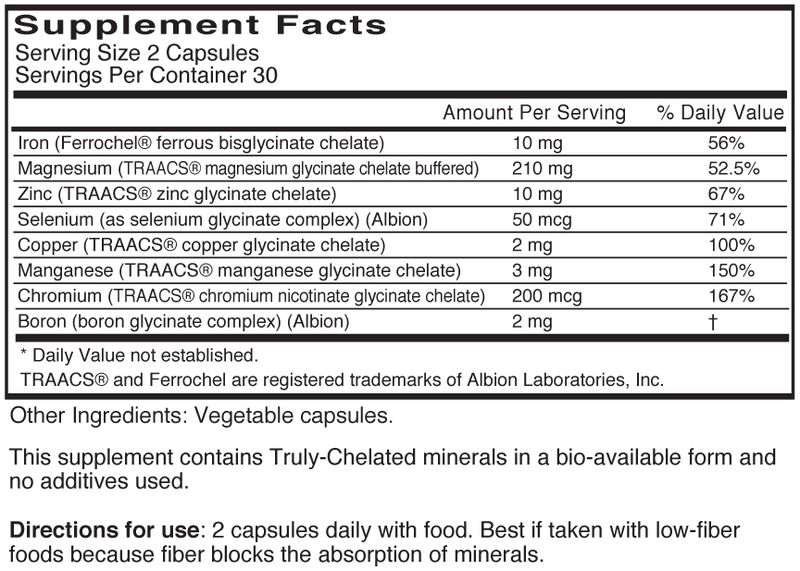 Minerals and Vitamins are cofactors or coenzymes. Together they make your biochemical reactions work up to 1 million times more efficiently! Everyone is spending money on vitamins, but few people give minerals the attention they deserve. Your body can't make minerals; like vitamins, they must come from your diet. In our opinion, mineral supplements are more important than taking vitamins, because vitamins are still in the foods; whereas, minerals through over-farming the land no longer are. 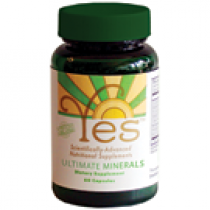 Eating properly and taking YES™ Ultimate Minerals gives you all the vitamins & minerals you need! 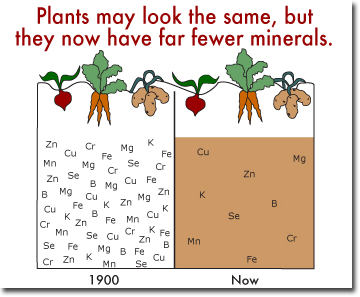 Minerals, in sufficient quantities, are no longer in our food because they are no longer in the soil. Here’s why: Along with over-farming the same land time and time again, most farmers use chemical instead of organic fertilizers, which depletes the soil of essential nutrients. Also be wary of so-called "fortified" foods that contain added minerals. The mineral may be "in there" but there are no guidelines requiring food manufacturers to use a bio-available mineral form (recognizable and usable by your body). The bottom line: Even though the minerals are added to the product, they are of little real benefit to you. Our research shows that many of us can greatly benefit from a combination of eight specific minerals that are depleted in the modern diet: Iron, Magnesium, Zinc, Selenium, Copper, Manganese, Chromium, and Boron. YES™ Ultimate Minerals provide these eight essential minerals in the correct form and amounts (no potentially harmful overdoses) for maximum use by the body. We do not include calcium in our supplement because Textbook of Medical Physiology clearly states: Supplemental calcium is not needed because there is a sufficient amount of calcium in food for proper bone development. YES™ Ultimate minerals are covalently (non-ionizing) bonded to amino acids for maximum bioavailability. The cell "welcomes" the protein, and along with it, the mineral. In order to get utilized by your body, minerals need to get into the cell. Another misconception is the value of Colloidal Minerals. The popular Colloidal Minerals are actually too large to enter the cell membrane. Floating in liquid (the definition of a colloid), doesn't mean it can be utilized at the cellular level. Don’t be deceived by the hype when it is contrary to basic biochemistry. Also, because of the way YES™ Ultimate Minerals are produced there is no "mineral competition" (a fight for use) present in many other products. We've effectively duplicated how nature intended us to get our minerals and our specialized formula is extremely effective so a little goes a long way!